Do you know what my favorite holiday is? No not Christmas, it's Halloween! And to honor my passion today I'm bringing you some inspiration on that matter. To do so I teamed up with wonderful Rosegal shop to bring you some festive ideas. While most of us go for wonderful costumes and doing perfectly right it's always an option. Some of us (especially in the countries didn't originally have a tradition to celebrate Halloween) might feel shy or awkward wearing costume! Or may be want show everybody how much you love the holiday by wearing regular themed clothes daily. For example - wearing a sweater or a dress with themed pattern or phrase. Moreover - you still have some time to order it and be in time for Halloween and with special prices! Check this section yourself (https://www.rosegal.com/promotion-Halloween-deal-special-148.html?lkid=11415213). 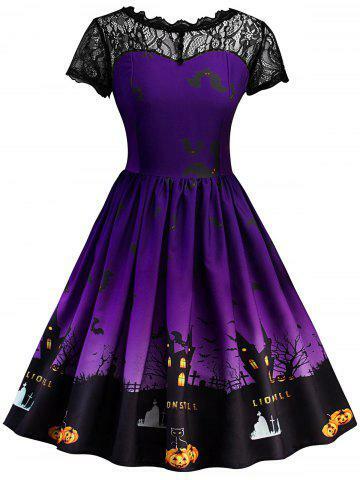 And so far I am sharing my own personal best casual non-costume Halloween appropriate dresses. I just love this one! Lace, pumpkins, and wide skirt - I don't know how about you, for me it sounds perfection. I own similar dress and wear it all year long. It looks lovely, it is comfy and it definitely adds some edge! The reason not to love - none. 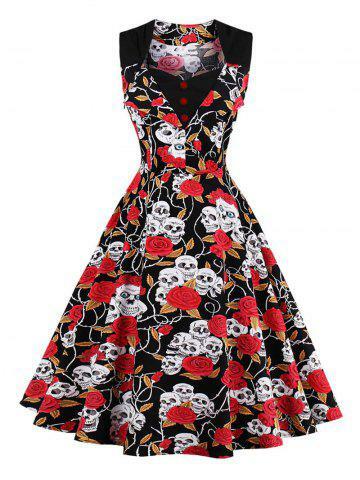 I recommend you getting such dress if you are looking for chic and a bit casual skeleton look. I following you now #1668, follow me back please? Amazing selection, so lovely dresses, like them dear!